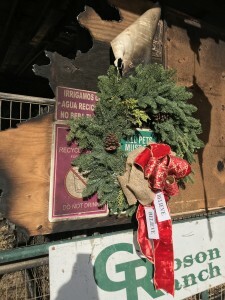 A wreath brightens the bleakness of a gutted stall. SUNLAND — For decades, Dale Gibson has been among the first to hitch his trailer and evacuate horses threatened by wildfires in the Los Angeles area. In fact, he would safely stage the animals at his Gibson Ranch until the smoke would clear — which is exactly what he was doing the morning of Dec. 6 when the Creek Fire ignited. When fierce winds shifted flames rapidly toward his facility, his crew and volunteers raced to remove 130 horses — 45 evacuees and 85 of his own — before the fire eventually consumed it. All animals made it out, including cattle used in his popular team sortings. Gibson announced recently that he will rebuild “on the shoulders of awesome people”, including friends,volunteers, and vendors like Castlebrook Barns, with a proposed reopening Jan. 15. All fields must be filled in to leave a message.